427 pin drive wheels set of 4. NOTE photo shows adapters apinners .This kit requires adapters,spinners and lug pins sold separately. Or if you already have a pin drive set up with hub adapters and are looking for another set of wheels they will work with most aftermarket adapters such as SUPERFORMANCE . Customer must have qualified engineer check compatibility. Also available in 6 pin please call for pricing. Please note the wheel shown in the photo is a representation of the wheel design and the appearance will vary depending on the offset/backspacing , we do have photos of most offsets upon request. 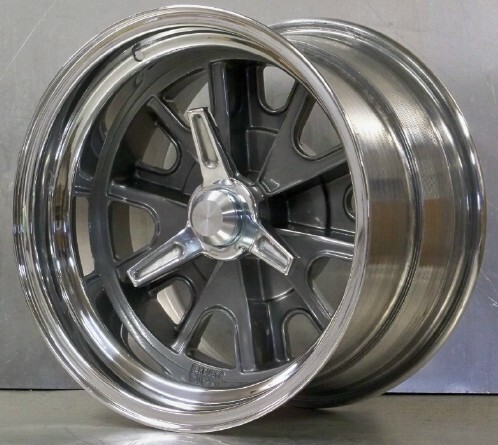 Wheel center color gray will highly polished lip . Black,white,fully polished or media blasted "as cast" look at extra cost - call 1888 339 7572 for pricing and lead time. Widths up to 14 inch !!!! !